This could have been titled Tales from the Dark Side, since it has become such an ongoing saga of bitter vindictiveness. However, it not one conservative Republicans should tire of, since it is the destructive Energizer Bunny of Arizona politics. Last year, The Nation, covered the undercurrents that have brought the intra-party tensions to the current fever pitch. Recently, The Arizona Capitol Times exposed the possible violations and financial filing inconsistencies of the group behind the pro-illegal hiring Wake Up Arizona! and the associated efforts to oust elected conservative Precinct Committeemen who have had the temerity to stand up for the employer sanctions law. So far the coalition of business owners opposed to Arizona’s employer sanctions law has contributed nearly $375,000 to the deceptively named Stop Illegal Hiring campaign, according to finance reports filed June 30, 2008 with the Arizona Secretary of State. Wake Up Arizona! President Marion “Mac” Magruder, a McDonald’s franchisee, heads the group which has promised to topple elected officials and candidates who support the Fair and Legal Employer act known as Employer Sanctions. That is the reason we are seeing the emergence of privately funded candidates like the previously life-long Democrat Tony Bouie and Jeff Flake’s recruited brother-in-law, Kevin Gibbons, challenging known conservatives in legislative races. This is also the reason the so-called Grassroots Arizona (PAC) is working fervently to depose elected district precinct committeemen and county officers and replace them with those favoring open borders and the accompanying cheap labor. 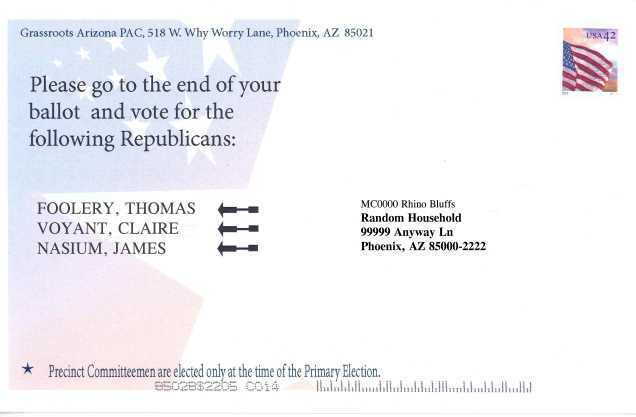 These seemingly benign mailers are arriving at Republican households in districts where conservative precinct committeemen who are on the ballot are being challenged by recruits in a concerted effort to overthrow the longtime party loyalists. In one single district, 45 of 83 precincts are facing such challenges. This is a sample of the reasonable sounding mailers. Don’t be fooled. Look for the mailers indicating the candidates endorsed by Sheriff Joe Arpaio. This entry was posted on Wednesday, August 6th, 2008 at 10:48 am and is filed under Any core values?, Arizona Politics, Deception, Elections, GOP Legislative Districts, Homeland Security, Illegal Immigration. You can follow any responses to this entry through the RSS 2.0 feed. Both comments and pings are currently closed. Now that is innovative. Why haven’t I thought of it? Anyway, my hat is off to the RRR * Republicans in LD-11. You can’t even fake it MR Kraus. I saw your name as giving $1,000 to the Grassroots Arizona PAC on the Secretary of State’s website. You know all about what you pretend to know nothing of. Mr Kraus claims to be such a solid Republican, but he is donating his money to defeat Conservative Republican PCs in districts other than his own, You are such a unifying force Mr Kraus. Couldn’t find enough to screw up in your own district? Ditto, Kate. This guy is such an inveterate liar. Just click on the link to the words Grassroots Arizona in this post, and his $1000 contribution shows up quite clearly. Horst Kraus should join his buddy, Tony Bouie and support the Democrat party. Every village needs their idiot. We’ve got the alchy Worst. Takes the wind right out of a great post on what mccamnesty’s minions are up to now. A real Republican nominee would beat Obama like a drum. This idiiot nominee is trying to win Obama votes instead of shoring up the conservative vote. What a huge loss this Presidential race will be for Republicans. We have the worst possible nominee. Your welcome Obama. We could only manage to put up the RINO mccain against you. You want fries with that? Let’s hear from Worst krause when we become comrades under Obama. This will be the biggest democrat landslide victory in history and we will have the RINO faction to thank for it. What is the point of a cretin like Horse Kraut aligning himself with the Republican Party? He is a true liberal, right down to his chosen business of running a nudist colony. The man is a destructive force within the party. Contributing money gains him access, but he has bile oozing from every pore. Read his comments here and especially on another site, where his venom towards a young family disgusts any reasonable human being. I hope never to meet him. You’re right to a point, Jay Bird. The other connection is John McCain. Read all of those donors on the link to the Grassroots AZ PAC. For starters, former state GOP chair, Mike Hellon is McCain’s southern Arizona coordinator. He is still fighting his losing battle to current chair, Randy Pullen. Every name on the list tells a story. And, the names missing from the list, but very evident in the background, are just as telling. AZ’s own Loni Anderson is part and parcel of this despicable sham. 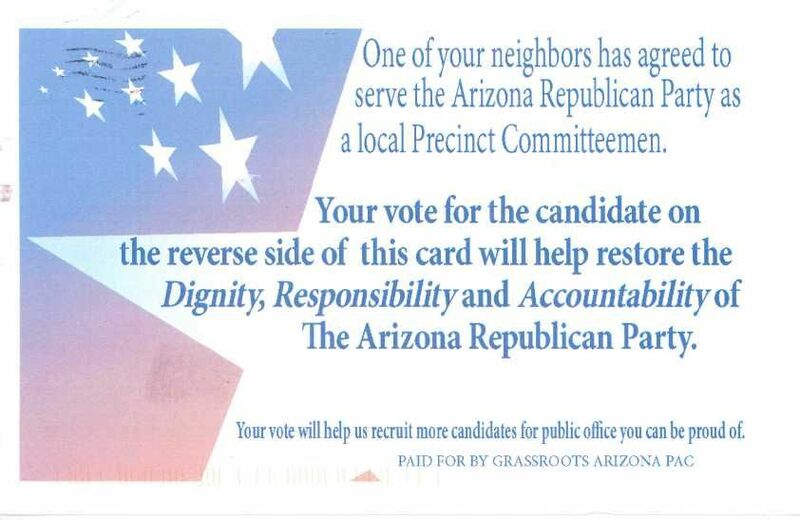 “Restore dignity, responsibility and accountability to the Arizona Republican party?” Those people have gall. They are working diligently to rid the party of those very traits and the people who have contributed so much to the AZ GOP. This is sheer arrogance and certifiable lunacy. They obviously have no capacity to feel shame for their actions. I feel ashamed FOR them. Ha! The names inserted on the mailer used here are very descriptive! Tom Foolery says it all! I also like RINO Bluffs precinct. Who says we conservatives don’t have a sense of humor? REAL precinct committeemen don’t “agree to serve.” They have a passion for promoting the principles of the Republican Party and recruit themselves into it. This is such a farce! I am so damn mad at these people who are working so hard to destroy what so many of us have worked so long and hard to build. This flyer, along with others being sent out around the valley and state, are unbelievably destructive and speak to the selfish motives of the “consultants” and power-hungry. I am thoroughly repulsed by what is going on. Rather than bringing people together, they are driving us apart. It’s clear that nothing or no one matters but these “players.” I plan to reregister as an Independent. What are you complaining about? They only asked me for a thousand, it’s their own fault if they didn’t get more. You know? perhaps you don’t, I am a Republican, and if a Republican Organization asks me to join, or make a donation, I usually do. Don’t take my word for it, I encourage you to check the S.O.S website. You are oh soo good at it. You are not Phil’s wife? it would be so refreshing if any of you post with their given Christian Names. Anyway, I un-screwed my district before it could happen. The schmuck who tried became too busy hiding his fiscal challenges and posing on the border as a patriot he simply had no time left to screw up the district. Pst don’t tell anybody, he is still trying. I forgive you too, for your insult. I won’t sue you either because your lawyer would most likely plead diminished mental capacity and that would be difficult to disproof. Same for you. You are safe. Rattle away, if that makes you feel better. The nudist colony as you put it is not a business, It is a hobby like other people play golf or polo. My business is buying distressed property from bankrupt debtors like wannabe legislators. Are you behind on you mortgage payments too? get in line I am buying. You too are forgiven for maligning my Christian Name. How about yours? why don’t you sign with your real name. Kate could look you up on the S.O.S web site and tell us of how much of your wallet you put where your big mouth is. You saw above, she is really good at that. “Open Borders” is a figment of your childish imagination like Santa Bunny and Easter Claus. Reasonable regulations of international trade including services (that means labor and specifically guest worker programs) was torpedoed by a little man with a loud voice and a lapel button with a red line across. You lemmings you all fell for it. Orion, keep on whining. Randy Pullen won. I accepted it. I help the AZ GOP and many of its candidates financially like a good Republican Partisan would and you try to poor crap over me for doing so. Shame on you. You say: “Restore dignity, responsibility and accountability to the Arizona Republican party?” Yes I am! And any wannabe politico who is fiddling like Nero while his own house is on fire, one who holds himself out as a fiscal responsible Republican while he is squandering his equity in pursuit of quixotic grandeur is not fit to serve the AZ Legislature. Congratulation on your sense of humor. If that post was genuine I owe you a drink. Beer, Wine or Cool-Aid. Your call. Cohesive Republican Party Unity was destroyed when out of your district the round lapel buttons with the red line emerged. Folks like me like to restore it. You have options. Join in or stay out. If you insist that we continue with the nuttiness of the past three years, we can do without you. Step aside, please. No one wants to get rid of real republicans. But we can do without the “Principal Proxy Slips”. You hear? This is the same group that talks about litmus tests to support candidates and fights anyone who doesn’t agree with them 100%, all to the riunation of the party. Maybe one day you will win, and take the party back to oblivion and the minority. Those with an all or nothing mentality often get what they deserve — nothing. I am just sorry that you narrow minded,short sighted individuals are taking my party down with you. I am none of the folks you scathingly reference, although reading their comments and yours, I certainly agree with them. You have shown yourself to be a miserably vicious, rude and arrogant braggart. What makes you so angry? Enjoy life and your family. Stop the attacks. Life is too short and from what I understand, you are no kid. Grow up. Yes! Take it back to the days of Ronald Reagan — which was hardly oblivion or minority. You are so angry and hate filled that you can’t even make sense and have no sense of (recent) history. Kraus answers 11 people who find him, his views and comments abhorrant. Who’s out of sync here? There are liberals within the GOP who desire to give us two left-wing parties to choose from. That’s what’s going on right now. We are being skinned and gutted. We can’t allow this ruination from within. Not really a laughing matter here but I have to voice my amusement over the donor list of Grassroots Arizona. You have mostly $250 to $1000 donors listed, then one person, with a PARADISE VALLEY address for gosh sakes, PARADISE VALLEY! Amount donated: Fifteen bucks. That’s how we roll in 85253. That’s a moderate donor putting their money where their mouth is for moderate PCs. Cute, but no cigar, Stan. And the other RINOs whose names don’t appear on this list are hard at work to defeat conservative Republicans. Jane Lynch is listed as the treasurer of this sterling organization, deceptively calling itself Grassroots Arizona but isn‘t listed as a donor. Their sole mission is attempting to defeat the elected precinct committeemen and women, the real grassroots workers for the ‘crime’ of being conservatives. And, nudist ranch owner Horst Kraus who said he wished he had thought of something like this, is featured with a $10000 donation. This is a bunch of liars and devotees of gutting the AZ GOP. I pray voters are not deceived.